Anyone who has ever spent time on a massive construction site or mine knows that there is some truly awe-inspiring massive machinery out there — trucks with tires two stories high and cranes that are capable of reaching all the way to the top of the world’s tallest buildings. 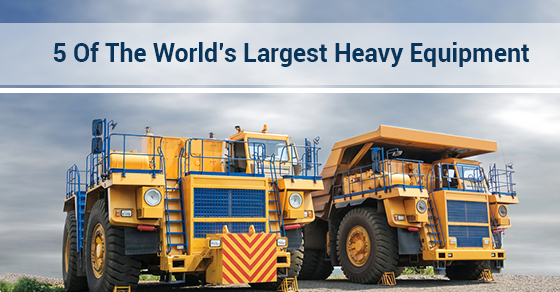 If you are curious as to what some of these machines are, below is a list of five of the world’s largest heavy equipment. The Komatsu D575A Dozer. A heavy equipment loan will get you access to some of the largest pieces of construction machinery in the world, including this one. This is the largest bulldozer in production. It comes with 1,150 horsepower and is capable of moving 90 cubic yards of material every pass that it makes. P&H L-2350 Loader. This 160,000-pound earth mover is the biggest of its kind and has a lifting payload of around 72 tonnes. Its bucket is 40.5 cubic feet and it boasts a 2,300 horsepower engine. It actually holds the Guinness world record for being the largest earth mover in existence. Liebherr 9800 Mining Excavator. One of Liebherr’s amazing creations, this is one of the largest bucket excavators in the world. Generally a mining vehicle, the Liebherr 9800 Mining Excavator tips the scale at a whopping 1,785,700 pounds and has a bucket capacity of an astonishing 62 cubic yards. Just imagine how many pools this machine could dig in a single day. Belaz 75710. In the world of heavy equipment loans, this is known as the vehicle that recently took the place of the CAT 797F dump truck as the world’s largest dump truck. It is 26 feet tall, weighs over 450 tonnes and is powered by twin 65-litre, 2300-horsepower engines. The CAT 6090 Hydraulic Shovel. This massive excavating tool has an operating weight of 1,080 tonnes and is powered by the largest single engine that has been mentioned so far, with 4,500 horses. This is truly one of the most impressive pieces of construction equipment out there and comes with a price tag to match. Heavy equipment loans are designed to give you access to some of the above pieces of machinery without having to invest a ton of capital in purchasing it outright. These pieces of machinery are state of the art, are capable of tackling the largest, most demanding jobs on earth and are the best that the industry has to offer.